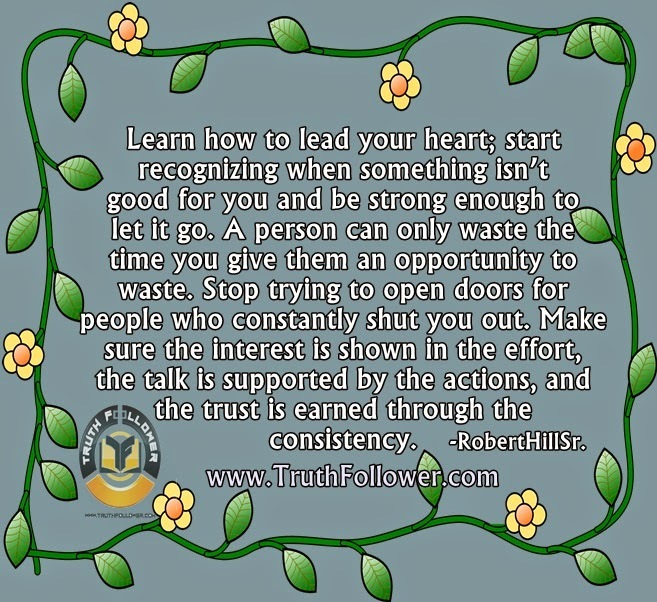 Learn how to lead your heart; start recognizing when something isn’t good for you and be strong enough to let it go. A person can only waste the time you give them an opportunity to waste. Stop trying to open doors for people who constantly shut you out. Make sure the interest is shown in the effort, the talk is supported by the actions, and the trust is earned through the consistency.RobertHillSr. How can I love again when I can't stop loving the one that hurt me so much? Life may lead me to new and different paths, meet new friends, learn new things, but this will remain true - wherever life takes me, I'll always remember the path where I met you. Learn how to lead your Heart picture/image is an Inspirational Stuff to Inspire and Motivate You. You can download pics by just clicking on the Images. Thanks for visiting Truth Follower an online place for huge collection of inspiring pictures, quotation, and Sayings Images. If you like Learn how to lead your Heart, Please Share with friends and family on Facebook, Twitter, and Pinterest.